The pictures for this post were taken by a good friend of mine from undergrad. All rights belong to him. 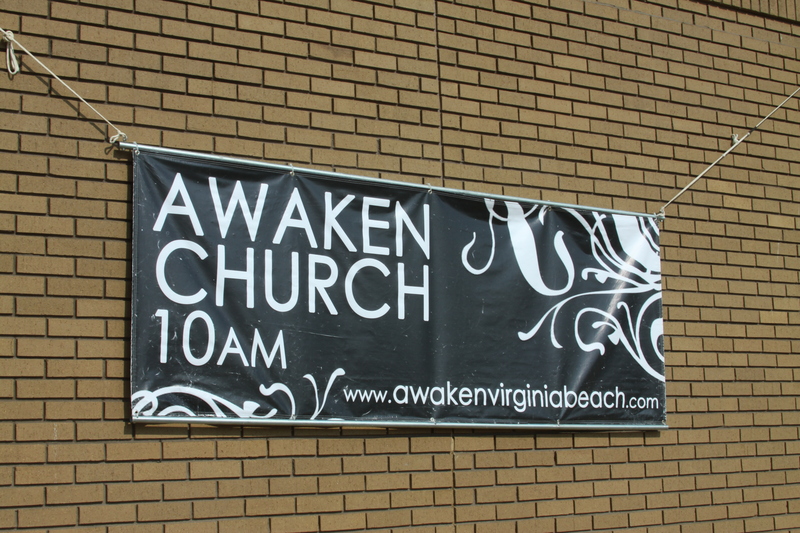 Awaken Church in Virginia Beach is a bit outside my usual haunt for religious sites to visit. It’s a growing non-denominational Christian community that officially kicked off its first public service in spring of 2010. My friend from undergrad moved out to Virginia for his job when we graduated in 2009, and people from his home in the midwest recommended this new church. He got in on the ground floor and started helping to organize the group for its public debut. I’ve visited the church twice now: once in the winter of 2009 (when they were meeting in the pastor’s home), and again in the summer of 2010 for a public service. When the group went public, they had to find somewhere to hold services. Having few resources, the church eventually decided on meeting in a movie theater at the local mall. Just a few weeks ago, I was visiting my friend in Virginia, and he mentioned that his church had found a new venue to worship in; the last service in the theater would be at the beginning of July. Since I wasn’t going to be able to make it to visit before then, I asked for him to take pictures to share with you all, which he graciously did. When I visited the church at the theater in 2010, it was my first time attending a church service that wasn’t held in a traditional church building. I was struck by how innovative the group had to get in order to recreate the worship experience you would see at some other churches. I’ve spent all my life floating around more traditional denominations, so I’ve never really considered what it takes to start a new church without any sort of hierarchy or organization backing it. 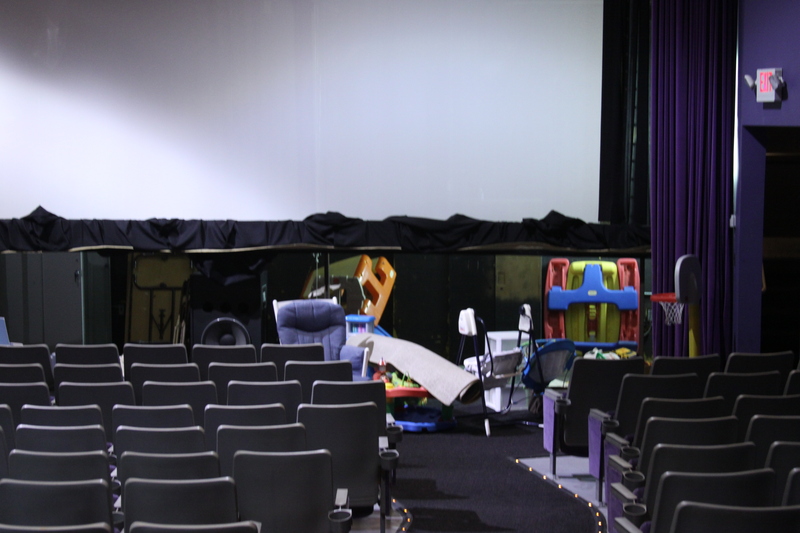 How do you set up a movie theater for effective worship? How do you recreate the niceties of worship at a traditional church? How do you store and transport all your equipment? The list goes on and on! So, storage. 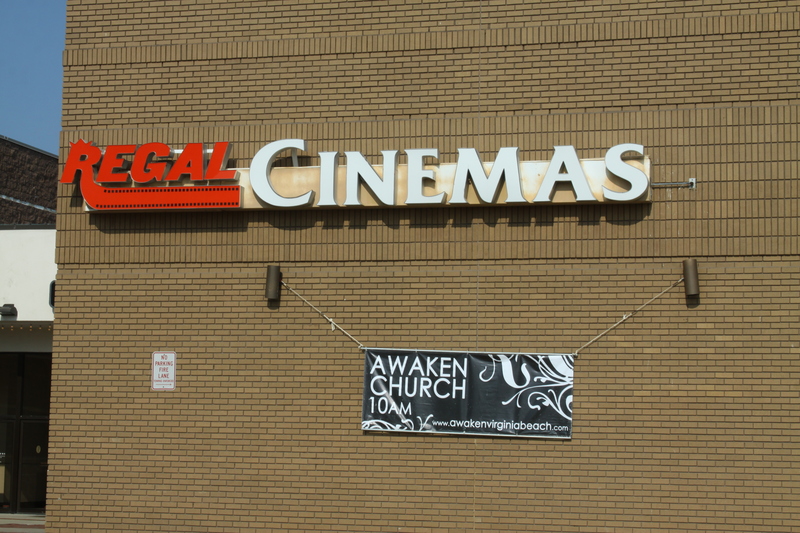 Regal Cinemas gave Awaken Church the space underneath and behind the screen in another theater to store all of their supplies. Back here goes there items for their kids area, coffee table, and worship service. You can see in the above picture that there isn’t any sort of stage in front of the screen, whereas there is one in the theater they hold their service in. 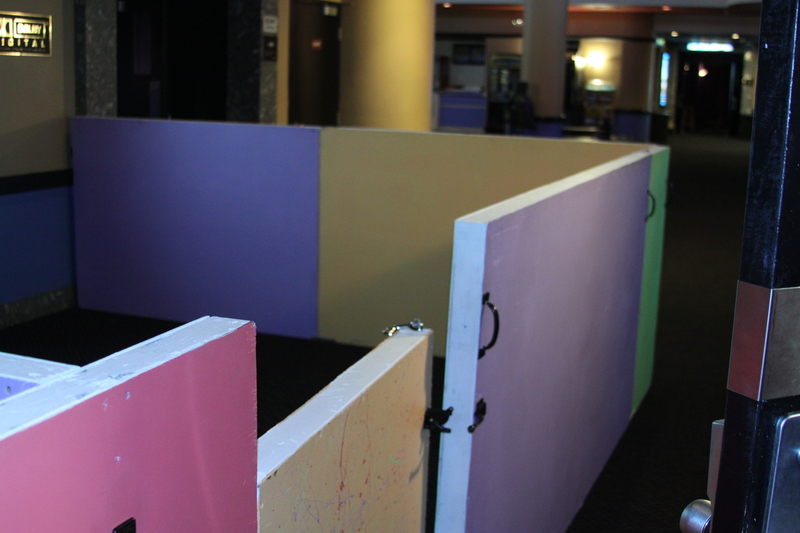 In the lobby area, they use several interlocking walls to form small pens for the children to play in. Two are set up – one for the smaller children to play, and one for the slightly older children to learn age-appropriate Bible lessons. Probably one of the most innovative parts of Awaken’s set-up is their lighting. 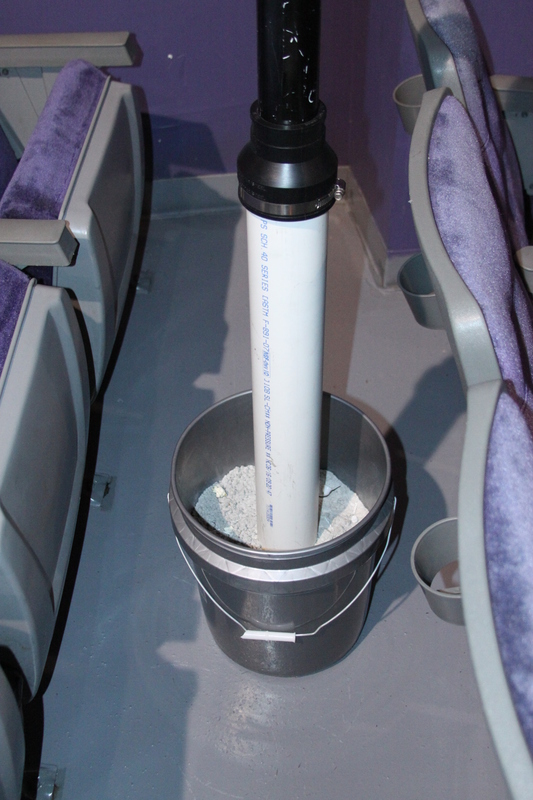 Movie theaters aren’t built for performances to be seen up on the stage. 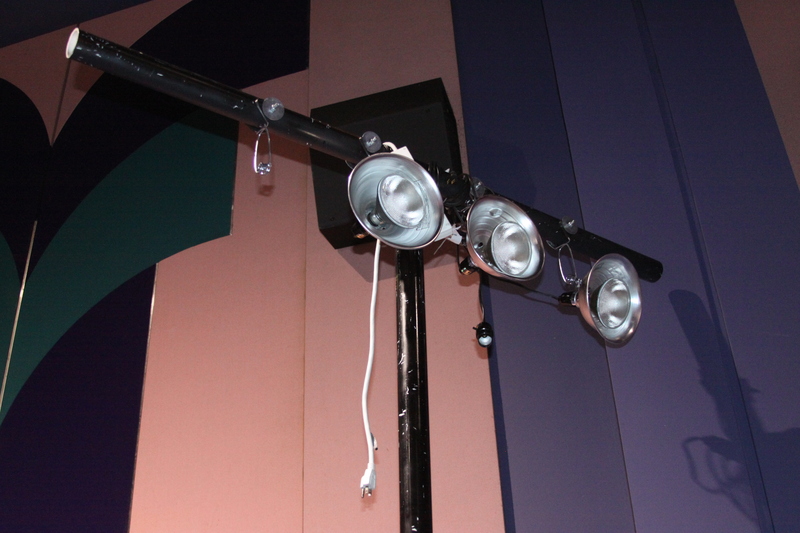 To provide better lighting, the church built this rigs that can be broken down for easy storage behind the movie screen. The lights are standard ones you would buy from a hardware store and are strung up on the T of the PVC piping using their cords. 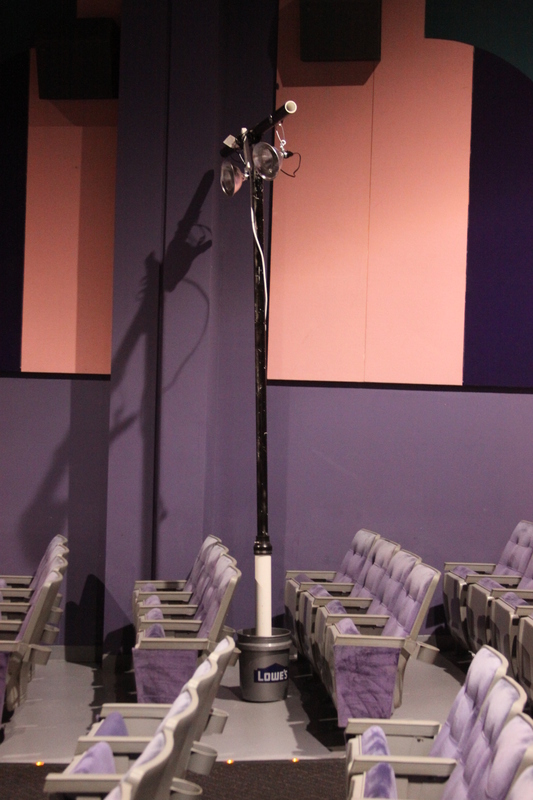 They’re then all plugged into a single extension cord, which you can see hanging down from the back. The extension cord is then plugged into another one which runs from the nearest power outlet to the lights. To keep the lights held up, the PVC structure is rooted in a bucket filled with concrete. It’s a bit unwieldy to move the lights in the bucket, so the PVC actually unscrews (between the black and the white pieces) to allow the lights to be moved and stored separately from the bucket and concrete. Aside from all of this, the group sets up a projector and computer in the back to project announcements, song lyrics, and the like onto the theater screen. They also have some small speakers they hook up to an MP3 player before the service starts so people have some worship music to listen to. And in a stroke of creative genius, they use popcorn buckets for collection instead of traditional baskets. 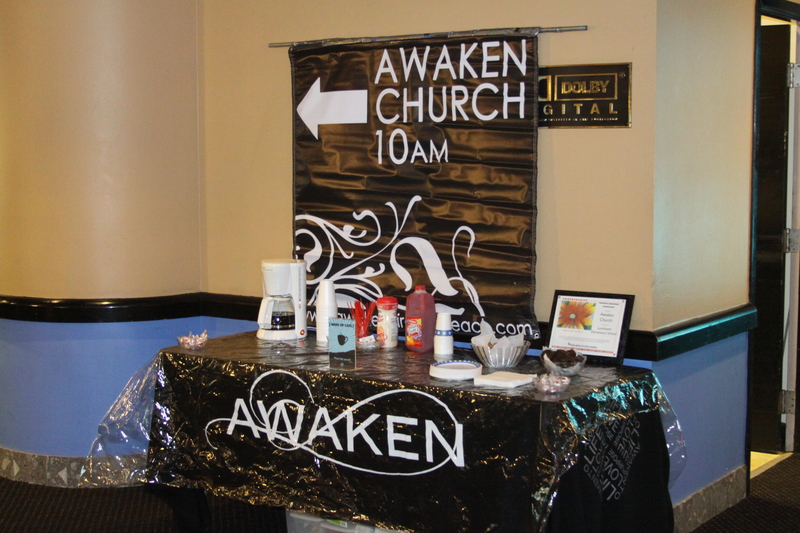 As part of a new partnership, Awaken Church now meets at Holland Road Baptist Church. This will allow the group to have a greater sense of stability and security while they continue their growing ministry. I’m looking forward to seeing how they’ve flourished the next time I visit! Hi! I stopped by from your link on Stuff Christians Like. It sounds like you are on a REALLY COOL Journey. I attend a church most like this one (non traditional, non denominational…North Point Community Church), so I thought I would leave my comment here. I visited the Sagrada Familia Bascilica in Barcelona, Spain…so beautiful and awe inspiring. I hope you and your boyfriend learn more about the Love of Jesus Christ than you ever even anticipated. Happy Travels!!! Thanks so much Niki! We’ve really been enjoying it, and are learning far more than I think we imagined. It’s a pretty awesome journey; I’m glad we’re lucky enough to take it!